Red Alert was not an iconic character to me when I was growing up. 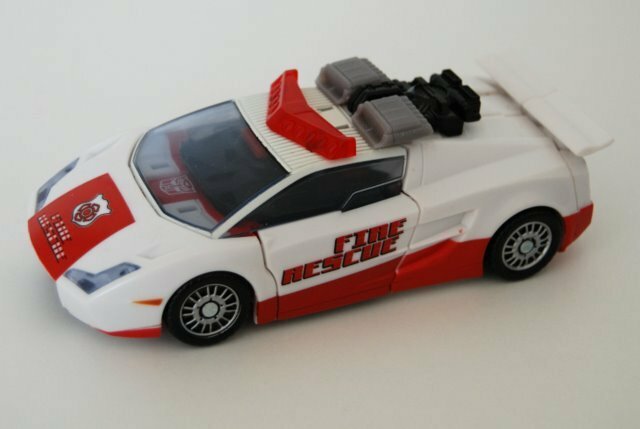 Characters such as Prowl, Ironhide, Jazz and Inferno seemed to catch my attention more than poor little Red Alert. Yet, in G1 cartoons , Red Alert is featured more than the others that were introduced with him (Inferno, Grapple, Smokescreen). However, I waited forever for this version of Red because of the success of Sunstreaker and Sideswipe. I loved both of the previous Lambos, but little did I know how much I would absolutely LOVE this new version of Red Alert. 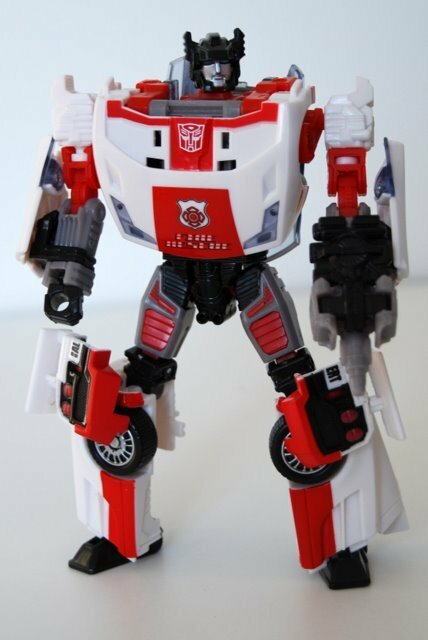 Red stands head, shoulders and torso above his old G1 self. His light bar is very cool, as is that super paint job. Well, on to the review! I must say that for this guy, I LOVE both modes every bit as much as the other. He is the same Lamborghini pseudo-Gallardo as is Sunstreaker and Sideswipe. In essence, this toy is -- as was G1 -- a repaint of Sideswipe. The first thing you notice when looking at the vehicle is the paint job. They did this one right! Of course, what fire department (except Turin, Milan or Rome) do you find a Lamborghini fire car? You don't. But it is SaWEEEEEEETTT!!! It rolls nice and hides the robot pieces well. This one looks great in vehicle mode for a show piece. I would rank the three I have in appearance 1). Red Alert, 2.) Sunstreaker, 3.) Sideswipe. Until this time, Sunstreaker was the hands-down winner of the appearance award since he came out, but since seeing Red Alert's appearance, I must say that of the regular non-convention , non-Henkei versions, Red Alert is the best. To me, he even beats out Punch/Counterpunch for appearance. How close did they get to the real Gallardo? Pretty close! There are a few minor details, but the shape and the finish is there. I actually can compare a Gallardo scale model to the three and say that with minor cosmetic differences, this IS the Gallardo. Again, Red shines. His face beats out Sunstreaker's by a very narrow margin. The overall robot's appearance is really a masterpiece no matter where you want him in your collection. The large Autobot symbol at the collar-bone region is a really good touch. He also has stiff joints- something my Sideswipe did not have. There is one ambiguity in Red's weapon. Unlike the other two Lambo brothers, Red cannot fit his turbo booster on his back. Rather, one must stick it around the "tailpipe" gun. He also doesn't have his iconic rocket launcher from G1. The paint job lends well to Red's Robot mode. The only concerns I have with this toy are the ball joints in the feet and the swivel joint for the arms. His transformation is exactly the same as Sideswipe's. If I didn't have the first two Lambo's, I might need directions. Somehow, the Transformation came easier this time around. Transformation Design: 5/10 Not too hard, considering I already had Sideswipe for quite some time. Otherwise, it's old hat. Articulation: 10/10 All major point of articulation well placed. Great poseability. Aesthetics: 10/10 Red Alert narrowly beats out Sunstreaker for the best paint job in the Classics genre. Like the face. Gun looks great ( if you can hold it together). Durability: 9/10 Incredibly solid. Joints are very stiff. Weak points are the cheaper feeling feet and the swivels on the shoulders. Windows are always a point of consideration. Packaging: 8/10 What's with Hasbro chucking the Tech Specs? Tech Specs are integral to the TF line (except Animated). Good artwork. Great new paper twist ties that you can sink your nails into. Fun: 9.5/10 Surprising, because I was never much of a G1 Red Alert fan. I bought this one to complete the set of three regular issue Lambo's offered in the Classics line. The fact that there is no rocket launcher dampened the score only by half a point. Price: 9/10 $9.97 at WalMart. A real steal. Overall: 10/10 I waited for over a year to get my hands on one of these. I am glad I waited! I knew there was no reason to bust my budget on a Henkei if I could get the same thing from the Generations line for a fraction of the price. If someone decides to make one of those "enhancement packs" such as they did with Springer, Optimus, Rodimus and Ultra Magnus, then it would make the figure even sweeter.